The Altyn Saka Animation Film Festival of the Turkic World took place in Kazakhstan in late September. 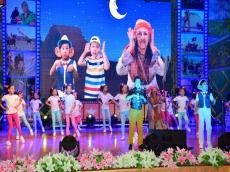 The festival was organized in cooperation with TURKSOY to celebrate Turkistan, the Cultural Capital of the Turkic World 2017, and aimed to strengthen the ties of friendship and brotherhood, foster solidarity and cultural interaction. The festival held in the Cultural Center on the campus of the Akhmet Yassawi University in Turkistan gathered nearly 20 animators from Azerbaijan, Turkey, Kazakhstan, Kyrgyzstan, Uzbekistan, Bashkortostan, Yakutia and Altai, turksoy.org reported. The jury of the festival included the Coordinator for Children's programmes of the TRT Channel Bekir Y?ld?zc? (Turkey), the editor of the “Kazakfilm” Animation Films Company Saltanat Dungenbaeva (Kazakhstan), the Art Director Ibrahimov Kudaybergenovish (Kyrgyzstan) and the Director of the Shymkent SAK Film Studio Nuriddin Pattev (Kazakhstan). Prior to the Festival, a press conference was held, where members of the jury delivered a speech in which they stressed the importance of the fact that the festival took place in the Cultural Capital of the Turkic World 2017. They also expressed their gratitude to TURKSOY for its valuable support and wished success to the competitors. Following the event, the official opening ceremony of the festival took place in the presence of animators from Turkey, Kazakhstan, Azerbaijan, Kyrgyzstan, Uzbekistan, Bashkortostan, Yakutia and Altai along with jury members, officials of TURKSOY and young spectators. Later, animation films were presented to jury members and the audience. At the closing ceremony of the festival, members of the jury announced their decision. During the closing ceremony, prizes were handed over to their winners. Upon joint decision of the jury members The Grand Prix went to Abay Abilde (Kazakhstan-Almaty) for the animation film “Those Who Were Made of Fire". The First Prize went to Dmitriy Vlasov from the Uzbekfilm Animation Studio (Uzbekistan) for the animation film “Gonçar”. The Second Prize went to Arif Osmanoglu from Turkey for the animation filkm “Pirates of the Sea”. The Third Prize went to Kuat Konirkuljaev from Kazakhstan for the animation film “The Praising Girl". The Best Screenwriter award went to Sofiya Cmuldin (Kazakhstan-Shymkent) for “Mamut Searching for his Mother". Finally, The Best TV Scenario Award went to Nurullah Yenihan (Turkey) for his animation film “Nasreddin Khoja”.